Team Ontario compiled a 3-0 record on Day 3 of the Canada Basketball National Championships on Wednesday, August 8, as the U15 and U17 Boys earned victories in Kamloops while the U15 Girls secured a win in Fredericton. Ontario’s U15 Girls—ranked No. 1 entering Nationals—clinched the top spot in Pool A with a 59-50 victory over second-ranked Quebec. Izabella Zingaro (Bolton) and Lauren Audino (Welland) led the way with 10 points each, while captain Jadyn Weltz (Timmins) contributed eight points and eight rebounds. Keswick native Isaline Alexander made her presence felt on the defensive end of the floor, recording seven rebounds and two steals. See the full box score for U15 Girls Team Ontario versus Team Quebec. Team Ontario (2-0) will meet Team New Brunswick in the quarter-finals on Thursday, August 9 at 7:15 p.m. ET. Ontario’s second victory of the day came courtesy of the top-ranked U15 Boys, who cruised to a decisive 105-73 win over No. 2-ranked Quebec. Waterloo native Josiah Davis continued his strong play, pouring in a game-high 30 points to go along with six rebounds and four steals. Javier Gilgeous-Glasgow (Toronto) tallied 22 points and five rebounds, while Vaughan’s Noah Ngamba chipped in with 19 points and eight rebounds. See the full box score for U15 Boys Team Ontario versus Team Quebec. With the win, Ontario’s U15 Boys have secured first place in Pool A and will square off against Team British Columbia in the quarter-finals on Thursday, August 9 at 11:15 p.m. ET. Ontario’s U17 Boys are headed to the semi-finals after defeating Team Manitoba, 81-77, on Wednesday evening in Kamloops. Team Ontario was paced offensively by 15-year-old Ryan Nembhard (Aurora), who poured in a team-high 20 points to go along with five rebounds and four assists. Meanwhile, Markham native Ben Li notched his first double-double of the tournament, totalling 18 points and 12 rebounds. Nursing a two-point lead late in the fourth quarter, Nembhard—who won gold with the U15 Boys at National Championships last summer—stepped to the foul line and calmly converted two clutch free throws, securing the victory for Ontario. Head Coach Jamie Campbell credited his team’s second-half defence as a primary factor in staving off a talented Manitoba team. See the full box score for U17 Boys Team Ontario versus Team Manitoba. The U17 Boys will take on the winner of Quebec versus New Brunswick in the semi-finals on Friday, August 10 at 9 p.m. ET. After an off-day on Wednesday, Ontario’s U17 Girls (1-1) will begin the knockout stage with a quarter-final tilt against Nova Scotia on Thursday, August 9 at 5 p.m. ET. Watch #TeamO games live and follow all the action at Nationals on Ontario Basketball’s Twitter, Instagram and Facebook. Need to get caught up on #TeamO results at Nationals? Read the previous daily highlights: Day 1 recap and Day 2 recap. 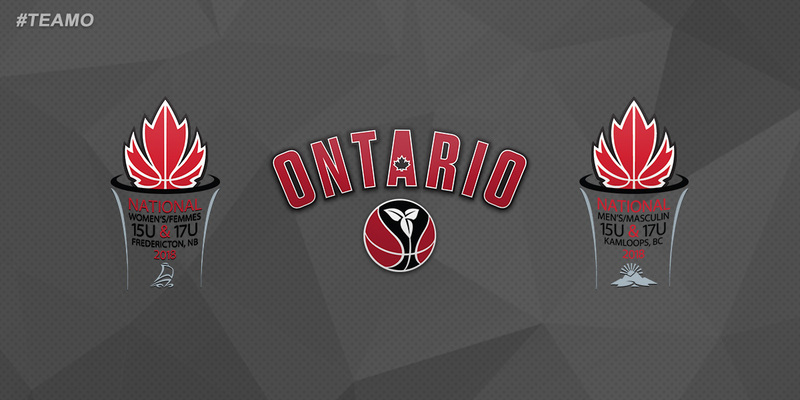 Team Ontario consists of the top male and female basketball players in the province in the U15 and U17 age categories, and the teams are a continual medal favourite at the annual Canada Basketball National Championships. Team Ontario’s coaching staff also represents some of the top coaches in Ontario. Between the four teams, Team Ontario has won gold at nearly 75% of the national championships since 2002. Written on 2018-08-09, in News.